UPDATE: The shooter had been volunteering at a community center for gay, lesbian, bisexual and transgender people (LGBT), according to the Associated Press. The Gunman is identified as Floyd Lee Corkins II and the guard is identified as Leo Johnson. UPDATE: The Shooter was also targeting the Traditional Values Coalition, according to TVC President Andrea Lafferty who says their office address was on a paper in the gunman's pocket. 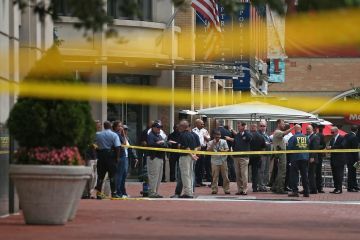 A hero guard was shot today (8/15/2012) as he stopped a gunman from entering the Family Research Council in Washington, DC. The shooting is being investigated as an act of domestic terrorism. Family Research Council is a Christian, conservative based organization. Fox News reports that witnesses say the shooter was speaking out against the Family Research Council's Pro-Life, Pro-Family agenda as he tried to enter the building. A security Guard stopped the shooter to ask where he was going and that is when the security guard was shot. Thankfully, the guard fought back, even after being shot, and was able to wrestle the shooter to the ground and took the gun. Witnesses say that after the shooter was subdued, the shooter told the guard, "It was not about you, it was about what this place stands for." The shooter was allegedly even carrying a Chick-Fil-A bag as he tried to enter the building. "He’s taking a bold stand," Perkins said after Cathy’s comments were reported. "Chick-fil-A is a Bible-based, Christian-based business who treats their employees well. They have been attacked in the past about their stand. But they refuse to budge on this matter, and I commend them for what they are doing." Family Research Council has been involved in protecting traditional marriage nationwide and fighting against the killing of unborn babies. FRC recently supported and promoted the Chick-Fil-A Appreciation Day. I was one of the many people who waited in line to get a chicken sandwich at Chick-Fil-A to support free speech and support traditional marriage. It was a record breaking day for Chick-Fil-A. Those opposed to Chick-Fil-A and Christian, conservative values must have been very upset to see that most Americans support family values. Chick-Fil-A Appreciation Day brought thousands of supporters to EACH Chick-Fil-A all across America. The anti-Family, Pro-Abortion, Pro-Homosexual Marriage supporters were only able to get very few supporters to show up to protest "kiss ins" at few Chick-Fil-A locations in America. Even as I post this article, the liberal New York Times has the articles about this shooting at the bottom of the news section under the title "More News." Higher up on the NY Times front page, under the main news section, they have a much more breaking news article titled: Gay Male Stand-Up Comics Await Spotlight.